﻿ How to create barcodes on Windows Azure Cloud? How to create barcodes on Windows Azure Cloud? Windows Azure is an open and flexible cloud computing platform created by Microsoft for developing software applications that runs on a global network of datacenters. This platform equips developers with capabilities for building websites, running applications and infrastructure on virtual machines and managing data through SQL Azure or Storage services. 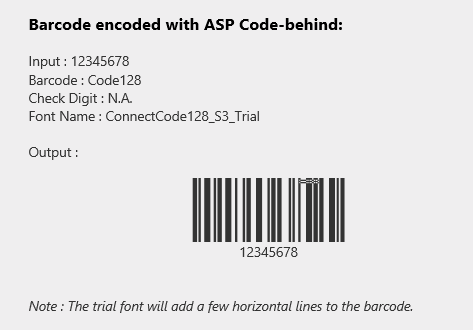 This tutorial shows how to generate standards-compliant barcodes on Windows Azure using ConnectCode Barcode Web Fonts. Using a web font to generate barcodes has several advantages. A font rasters to the resolution of printer and would create barcodes of the highest quality that meet the strictest industry standards. This approach also allows easy integration with different cloud platforms with minimal or no code changes. To create a barcode using a web font is a simple two-step process: the first is to encode input data to generate barcode characters and the second step is to apply the fonts on the encoded characters to render the barcode. During the encodation process, input data is verified and trimmed as some barcodes only support a subset of the ASCII characters. Start/Stop and check characters required by industry barcode specifications are also added automatically. This tutorial creates the Code 128 barcode specifically. However you can easily adjust it to create Code 39, EAN13, GS1-128, UCCEAN, I2of5, Industrial 2 of 5,Modified Plessy, ITF14, UPCA, EAN8, GS1 Databar14 and many other barcodes supported by our barcode web fonts. 1. Right click on Visual Studio (2010 or 2012) and Run as Administrator. This is to ensure that Visual Studio has the necessary permissions to run the Windows Azure tools correctly. Click Yes when you are prompted with the message "Do you want the following program to make changes to this computer?" 2. Go to File->New->Project->Templates->Visual C#->Cloud and select Windows Azure Cloud Service. This tutorial focuses on using C# but you can also choose to use Visual Basic as the language. Note : If you see the "Get Windows Azure SDK for .NET" on the dialog, it means the Azure SDK is not yet installed. In this case, you will need to double click on the button to install the SDK on your PC. 2a. Select .Net Framework 4.0 or 4.5 and click on the Ok button. 2b. 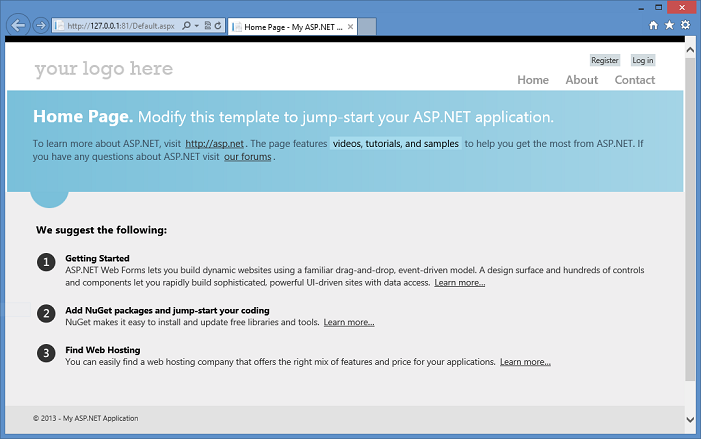 In the .Net Framework roles, select ASP.Net Web Role and add it to the Windows Azure Cloud Service solution. Click OK and Visual Studio will proceed to create the project. 3. At this point, you may want to click on Debug->Start Debugging to test the generated project immediately. This is to ensure that you are able to run the generated code before any changes are made. Please wait until you see the Internet Explorer is launched and the screen as shown below is displayed. The screenshot below is the output captured for Visual Studio 2012. For Visual Studio 2010, it may look slightly different. If you encounter errors such as the IISconfigurator.exe error, please check out MSDN blogs/forums to resolve the issues. In our labs, we resolved some issues by adding "IIS Management Console" in "Windows Feature". 4. Next we are going to add the barcode web fonts into the project. 4a. Right click on WebRole1, select Add->New Folder and name the folder as "Fonts". 4b. Right click on the "Fonts" folder and select Add->Existing Item. Three Code 128 font files of OTF (Open Type), EOT (Embedded Open Type), Web Open Font Format (WOFF) formats are added to the project. ConnectCode provides a pair of font files for each type of barcode (of each specific size) to ensure that you can generate barcodes that on different browsers and platforms, including older versions but widely-used browsers. In the later part of the tutorial, you will notice that we make use of CSS to utilize the optimal font on the different browsers. Note - If you want to encode other barcodes, select the fonts from a different directory. 5a. Right click on WebRole1->Scripts and select Add->Existing Item. 6. All the necessary font files and encoding scripts have been added. We are now going to modify the Default.aspx file to display the barcode. First, double click on the Default.aspx file. The above HTML code includes the code 128 barcode encoding scripts into Default.aspx and also defines a font-face for a font family known as CCode128_S3_Trial. 7. Next, we are going to add content that contains the input data to Default.aspx. For a complete list of functions available, please see customizingbarcodewebfonts.shtml. This HTML page can also be printed and the barcode easily scanned without any resolution issues. This is a barcode that can help you meet very strict industry requirements required by organizations such as GS1. 10. First, we are going to add a .Net DLL to perform the barcode encoding to the project. 11. Next, double click on Default.aspx.cs file. In the Page_Load function, add the following blocks of C# code. Note : BarcodeFonts is a class in the package Net.ConnectCode.Barcode so it is important to remember to add the "using Net.ConnectCode.Barcode;" line at the top of this class. In the above block of C# codes, we have setup the type of barcode using the "BarcodeType" property and the data to be encoded in the "Data" property. The encode() function is the method that performs the encodation and adds all the necessary start/stop and check characters. Notice the use of the CCode128_S3_Trial font name. 12. In step 11, we have used the barcode and barcode_text div element without defining them. Now, we are going to define them as shown below. Remember to place the 'runat ="server"' attribute in the barcode and barcode_text elements. This will allow the programming codes in the ASP.Net Code-Behind to access the elements. 13. Click on the Run (or Run Internet Explorer) toolbar button in Visual Studio and this time you should see a second barcode displayed. 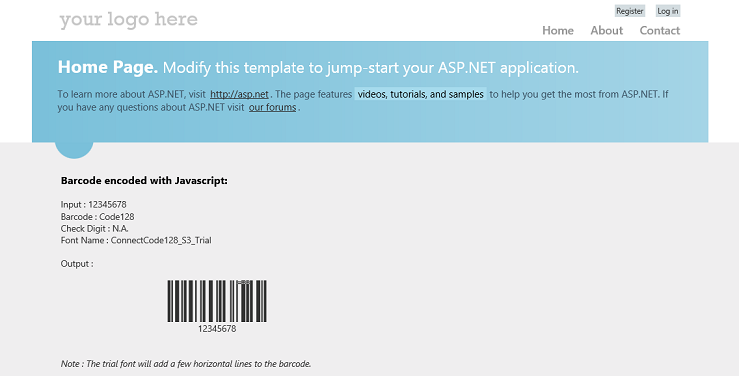 This barcode is encoded with the .Net DLL in the ASP.Net Code-Behind.